When moving to a new country one of the best ways of making new friends and staying fit is through sport. 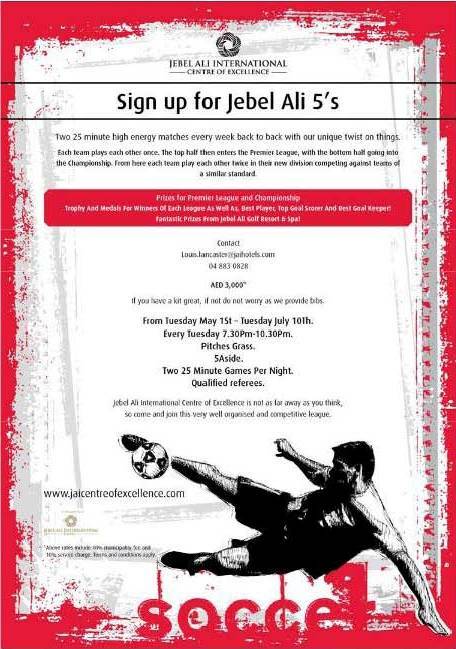 If you love football and want to play competitively whilst still having plenty of fun, then why not put together a team of five and sign up for Jebel Ali 5’s. What will ensue is two 25 minute high energy matches every week, back to back, with a unique twist. Each team will play each other once. The top half then enters the Premier League, with the other half going into the Championship League. From there each team will play each other twice in their new division, competing against teams of a similar standard. There are fantastic prizes for both the Premier and Championship Leagues courtesy of Jebel Ali Golf Resort & Spa. Trophy and medals up for grabs for the Winners of each league as well as Best Player, Top Goal Scorer and Best Goal Keeper! If you have a kit great, if not do not worry as they will provide bibs. Jebel Ali Centre of Excellence is not as far away as you think, so go and join this very well organised, fun and competitive league. For more info or to register, visit www.jaicentreofexcellence.com, email louis.lancaster@jaihotels.com or call +971 4 883 0828. * Above rates include 10% municipality fee and 10% service charge. Terms and conditions apply.